Everything that achieves balance isn't square. As my yoga teacher said to me in class yesterday as he tried to get my spine to move in a more wavelike pattern: straight lines are something humans made up, not nature. We sit in square offices, in front of square computers, sleep in square beds. My mind connects better when I, literally, think outside the box. For me that's using every single opportunity to take a workout outside and reconnect with that spark of creativity and passion for exploring, challenging myself and surrounding myself with something bigger than myself. Traversing a mountain on foot and navigating trails takes a type of focus that is hard to find on a treadmill. Every step sets foot on something new and that element of danger fires up my adrenaline and I go harder, faster, longer. My adidas family challenged me to take their outdoor product into the elements. It was perfect timing as I was making my way down to the Dolomites from Germany last month and needed something that suited the complicated climate and terrain. We started in a Mediterranean climate and ended up a few miles east on top of Europe's largest Alpine meadow filled with medicinal herbs and thoughtfully carved out paths. This was a warm up to what else lay deeper in the mountains. We were on the cloud line, almost 7k feet up in the sky, and I could feel my lungs squeezing for more air but the thrill of being able to jog along one of the most beautiful plateaus in the world was intoxicating. From the meadow, we packed the gear and went deeper to find one of the most beautiful lakes on Earth, Lago di Braies. The lake was like emerald glass. Dirt trails circle the lake and aside from a few old wooden canoes, the best way to see the whole damn thing is to just lace up and run. This lake sits right at the start to some of the most majestic, jagged peaks in the area. It's a playground for hikers, trail runners and adventurists. World Wars were fought on these mountains, castles and old hunting chalets pop up everywhere and if you're lucky to have time, sleeping in a cliffside refugio is one of the coolest experiences you'll ever have in life. If you find yourself in this area, living outdoors is engrained in the culture here. Trail maps are plentiful and locals are extremely eager to share the beauty that has existed here for thousands of years. From the Lake we explored the Val Gardena and Alta Badia regions, which included one of our favorite hikes and trail runs on the Lagazuoi. There were hidden lakes, edelweiss and steep climbs mixed with wide open vistas. This is where one of the battles of WWI was fought and we were running past shrapnel and decaying metal mixed in with the white rocks. It's not too late to take advantage of the outdoors. End of August and September are some of the most gorgeous times to get outside. Trails exist everywhere. Challenge yourself to switch up your routine and flip your mindset. You may find yourself falling in love with running and use it as a function to explore your environment. Preparation is Everything- As much as I love adventure and not knowing what's around the corner, it's really important in these areas to be prepared. Pack a bag filled with enough water and snacks, map out your plan and get to know the area ahead of time. iPhones don't work here that well so a physical map and understanding of the area is key. Stay Dry & Warm/Cool- What you choose to wear is one of the most important decisions before a high-altitude run. Weather is extremely unpredictable. We saw blue skies change in an instant to a thick cloud with freezing rain, and this is in July! Clothes should have the ability to keep you cool and dry, therefore maintaining a steady body temperature no matter the elements. I have on the Terrex SkyClimb top that repels water and has the perfect balance of breathability and climate control. Feet First- What I put on my feet can make or break my experience hiking or trail running. I focus on something with great traction (rocks can be deceivingly slippery) and something that can keep my feet dry if they get wet. If the extremities get cold/wet first then the whole body follows very rapidly. I wore the Terrex shoe and broke them in for the first time on this trip and felt light and happy. No blisters, no pain. 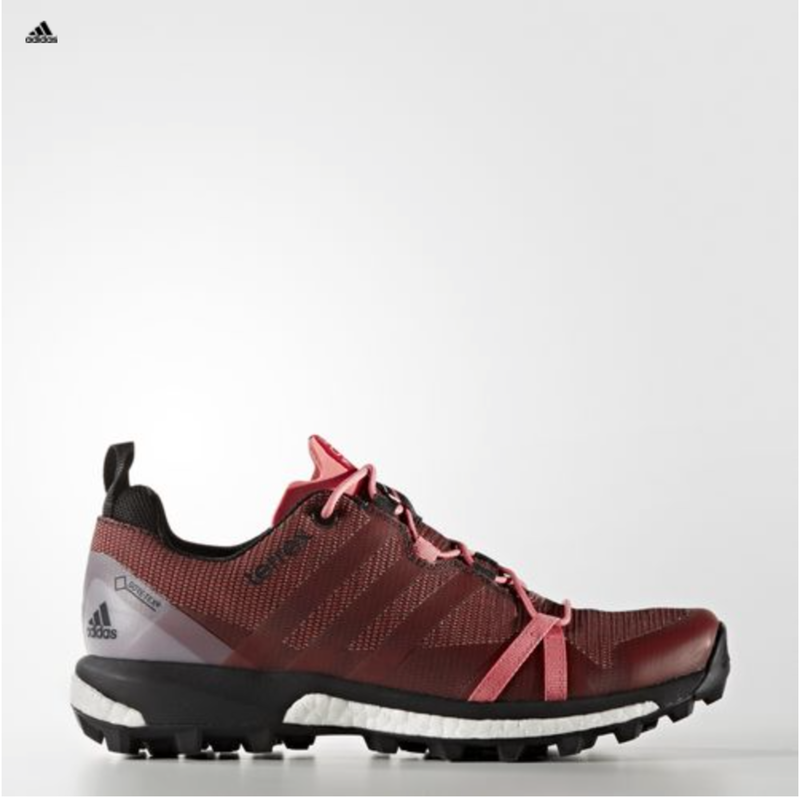 I wear the Boost shoe to workout normally so carrying that tech into trail running was a really seamless integration for me. A great resource for trails here.